Before the invention of the computer or calculator, merchants used counting boards or an abacus to keep track of inventory and their finances. The abacus replaced other primitive counting devices such as fingers, sea shells and small rocks or sticks. Beginning in 2700 BCE the Sumerian people documented the use of an abacus, made up of small rods and beads using cuneiform figures and one of the first known number system. This helped them to devise all sorts of calculations. In the 19th century, a Greek version of the abacus was found on the Greek Island of Salamis that dates back to 300B.C.E. It was made of a marble slab that had smaller pieces of wood or marble used to count with. This was the design of the abacus used in Western Europe until the French Revolution. 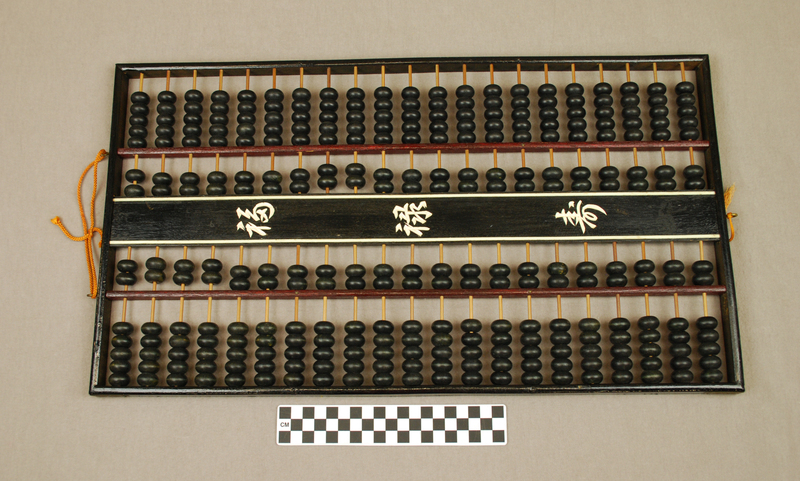 It wasn’t until the 13th century that the Chinese abacus, or suan pan, was first known to be used. Around this time the Japanese also adapted their own version of the abacus called the soroban, which is the same style as the one in the collections here at Institute of Texan Cultures. Unlike the Chinese version, the Japanese version has two beads on each rod at the top known as the “heavenly beads” and 5 beads on the lower end of the rod, known as the “earthly beads.” The upper and lower beads are divided by a reckoning bar. Each bead on the upper rods represent a value of 5. While the beads on the lower end of the rods represent the value of 1. Each rod is a value of a tenths place, more than 9 rods are needed when calculating high number values. There are several styles of abacus developed in China and Japan, including the 1/4, the 1/5 and the 2/5. Other countries have their own style of abacus. The Russian version, called the schoty, pronounced (SHAW-tee), was invented in the 17th century and each row has ten beads representative of our ten fingers. New versions of the abacus were still being developed as late as the 20th century. In 1958, a manual was published by Lee Kai-chen for a new style of abacus he recently invented. It is made up of two abaci. The top is the ¼ style soroban and the bottom is the 2/5 suan pan. He developed this hybrid version to help perform calculations of square and cubic roots. Ifrah, Georges. The Universal History of Computing: From the Abacus to the Quantum Computer. Ed. John Wiley. New York: F.A Praeger, 2001. Pullan, J. M. The History of the Abacus. New York: Praeger 1970.